Jaclyn Bouchard is the Senior Manager of S&P Global’s’ ESG (environmental, social & governance) strategy. Through data analysis, performance evaluation, and strategic communications she oversees the management of S&P Global’s ESG risks and opportunities globally. Among her areas of focus are tracking key ESG metrics, engaging senior leadership on corporate ESG performance and disclosing the Company’s material ESG indicators externally to investors and other key stakeholder groups. 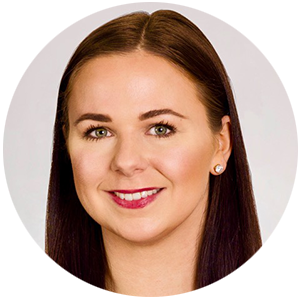 Jaclyn is also responsible for integrating ESG across S&P Global through strong relationship management and leading internal ESG-related groups including the Environmental Action Committee and Corporate Responsibility Council. She is charged with maintaining external relationships with strategic partners, such as the United Nations Principles for Responsible Investment and World Business Council for Sustainable Development. Jaclyn started at S&P Global in 2013. Previously, she worked in sales at Recyclebank, a New York City based start-up that focuses on clean technology and sustainability. Jaclyn served as a member of the Northeast Sustainable Energy Association’s Board of Director’s Development Committee. She is a recipient of the Columbia University Earth Institute Sustainability Management Fellowship award for her academic performance, professional experience, and commitment to sustainability issues. In 2017, Jaclyn received the Responsible 100 award from City & State which recognizes New York executives, thought leaders, visionaries, and influencers who are setting new standards of excellence, dedication, and leadership in sustainability. She has also received six ACE Awards from S&P Global colleagues for exceptional work and impressive contributions. Jaclyn holds a bachelor’s degree in Biology from Towson University, a master’s degree in Energy Management from New York Institute of Technology and a master’s degree in Sustainability Management from Columbia University.